Officials say the design addresses numerous deficiencies at the existing Oxford Street facility, which began its expanded, 24-7 service hours Monday. A new homeless shelter planned for Portland would feature 200 beds, separate dorms for men and women, a dining room and kitchen, a health clinic, lockers, a laundry room and an enclosed outdoor courtyard to discourage human traffickers and drug dealers from preying on the city’s most vulnerable population. City officials unveiled a concept plan and cost proposal for the new shelter at a City Council workshop Monday evening, the same day that the Oxford Street Shelter began its new 24 hours a day, seven days a week schedule. City officials said the current facility on Oxford Street is leased, poorly configured and expensive to staff because of its layout. A new shelter will allow the city to reduce staffing costs and prepare meals on-site as well as offer a range of mental and health services in one location. It will have parking for 28 vehicles and contain 200 beds – the Oxford Street shelter has 154 beds. 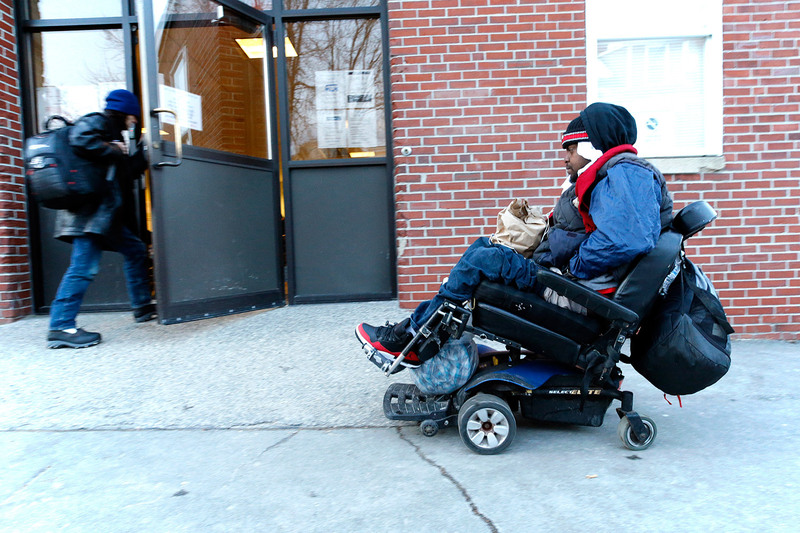 Nas Hirad drives his wheelchair to the Oxford Street Shelter, where he has lived for two years. The shelter now offers round-the-clock services. Hirad said he was relieved by the change. “There’s nowhere to go out there,” he said. Oxford Street’s shelter will remain open 24/7 until the new shelter is approved and open. City Manager Jon Jennings told councilors he has looked at several potential sites for a new shelter, but is not ready to nominate a preferred location. The first step will be to hire an architect for the project, with a request for proposals due to go out Dec. 19. The city hopes to hire an architect by Jan. 19. Jennings said the new 35,000-square-foot shelter would cost about $10 million – which does not include the price of the land – and the city may have to partner with one or more social service agencies to cover the cost. Jennings said the city could also consider bonding the project. He said the shelter will be one or two stories. The size and height will depend on the property it is built on. “This is something that is very significant, but it’s not going to happen tomorrow. We’re not at the beginning, but we are also not at the end yet,” Jennings told the council. 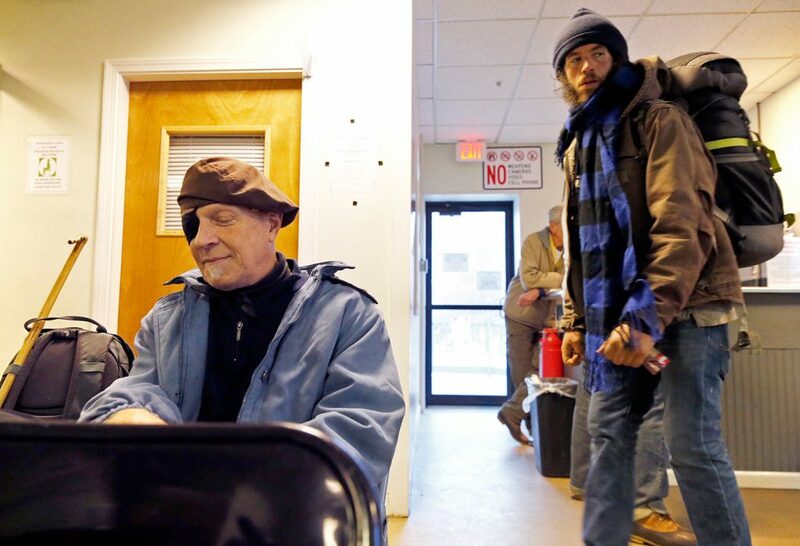 Rob Parritt, director of the Oxford Street Shelter, said Monday’s soft opening went well, with about two dozen homeless clients taking advantage of the new daylight hours. “Our guests were pleased,” Parritt said. Before Monday, homeless individuals would line up outside the Oxford Street Shelter each evening in hope of getting a warm place to sleep. But those clients would have to leave no later than 7:45 a.m. the following day, an exodus into the Bayside neighborhood and downtown Portland that led to complaints from residents and business owners. The day shelter offers four computer stations, which clients may use to apply for jobs and benefits or check email. Parritt said he also has scheduled several educational sessions, including one with a Maine Department of Transportation staffer who will talk about how to stay safe while walking at night. It will cost the city about $340,000 to staff and operate the day shelter through the end of the 2017-2018 fiscal year on June 30. The city says it will cover the costs with savings from its salary account. Future funding will be incorporated into the city manager’s budget. Parritt said the city has or will hire a supervisor of operations at the day shelter, a maintenance person and a street outreach worker who will assist clients with housing resources and encourage vulnerable, hard-to-reach people to use shelter services. “I’m really proud to work for a city that takes care of its most vulnerable,” Parritt said. He praised the proposed facility’s features, saying the Oxford Street Shelter is no longer able to adequately serve the city’s homeless. Under the current configuration, illicit activities such as drug dealing and human trafficking often occur outside the shelter building. But Parritt believes an enclosed courtyard will prevent predators from having contact with clients. In the current shelter, he said, there are too many isolated areas, making it hard for staff to keep an eye on everyone. The new facility will feature a centralized staff observation room with straight sight lines to all parts of the facility, he said. “We want it to be modern, clean and most importantly, safe,” Parritt told the council. Councilors praised the shelter proposal, but one, Kimberly Cook, wanted to know if other communities in Greater Portland would be willing to share the costs because homelessness is a regional issue. “Location is going to become a very big part of this discussion,” Mayor Ethan Strimling told councilors. Jennings said he anticipates bringing one or more potential sites for a new shelter to the council in the first quarter of 2018. “There will be an enormous amount of opportunity for public comment (before a site is chosen),” he said.